It’s my opinion that the world is divided into those who ‘believe’ and those who don’t. Of course there’s always a grey area of those who aren’t sure, and who believe in some things but not others, but for now, let’s keep things black and white (so to speak). There are those who believe in the paranormal and those who don’t. I’m generally quite a cynical person, but for some reason, I firmly believe that there’s most definitely something other than the grounded, mundane reality that we take for granted. I believe that there are entities and energies that attempt to communicate with those who are open to it. Vasey is what’s known as a ‘sensitive’: someone who is open to anything and everything from the astral plane that wants to communicate. He has since learned to control this, as he was attracting a lot of negative, dark energies. With maturity and practice, one is able to block out the unwanted attention. 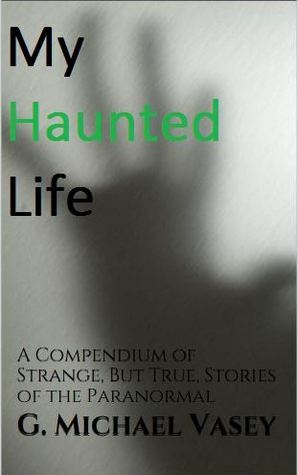 ‘My Haunted Life’ is a collection of Vasey’s experiences with the unknown. His accounts are direct, straightforward and not embellished in any way. Some are frightening, others less so, but all are similar in that these entities seek him out, whether in a waking or a sleep state. As he asks in the book: Do these experiences happen only to those who somehow attract them? I do remember many years ago, reading up on poltergeist research, that negative energies often attach themselves to young people – teenagers and/or children who are in a state of flux in their lives, leaving themselves open to attract negative energy flow. It seems that this may have been the case with some of Vasey’s experiences, where instead of the house itself being haunted, or occupied, it was actually he himself that had been taken over by some sort of spirit. The book is an easy read, but I wouldn’t recommend it if you’re not a believer. Don’t read it just in order to scoff and mock. Vesey has presented an honest description of occurrences as he experienced them. I would have liked there to be something linking each chapter, but I realise that one cannot create a connecting factor that simply isn’t there! The explanation of different research at the end was also fascinating.